Royal Brisbane and Women’s Hospital (RBWH) is a 1077-bed general, tertiary referral, teaching hospital located at Herston within the Northside Health Services District (NHSD), close to the Brisbane CBD. Garry Coff Consulting Services, under contract to Woodhead Architects, provided Health Facility Planning support to undertake a review of the Clinical Services Plan and to develop a Facilities Master Plan. The Hospital has a comprehensive range of specialties including medicine, surgery, orthopaedics, psychiatry, oncology, obstetrics, gynaecology, neonatal intensive care, and trauma services. It is one of the largest tertiary referral hospitals in Queensland providing approximately 11.5 percent of patient services to Queensland as well as serving patients from northern NSW. RBWH has a significant teaching and research role. The objective was to generate a strategic view of the service delivery requirements of the Hospital over the next 15 years and identify the physical implications required to meet the identified needs into the future. The Consultancy included the preparation of a planning framework for the efficient and effective achievement of the goals identified and included a response to the imminent relocation of The Children’s Hospital from the RBWH site to the Mater Hospital site. The planning process included a review of the relationship of the RBWH with feeder Hospitals in the RBWH catchment area and extensive consultation with the current site occupants. The Master Plan for RBWH includes a campus-wide zoning plan that recognises the benefits of the synergistic relationships between all tenants and occupants of the site and to generate a base that will assist in guiding and protecting future investment by all stakeholders. The planning solution identified a significant catch-up expenditure program of approximately $55 million and the requirement for a major capital project of approximately $360 million of upgrade and expansion to meet the projected needs of the Hospital for the next 10–15 years. Royal Brisbane & Women’s Hospital. 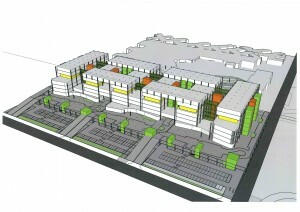 Garry Coff, supporting Woodhead Architects, developed the Master Planning and Schematic Design Phase of Redevelopment Proposals for the Logan Hospital, South of Brisbane. The planning incorporated an upgrade of the Hospital’s Emergency Department as a first Stage of work in a multi Stage expansion of the Hospital from 35,000 m2 to around 100,000 m2 comprising increased inpatient accommodation from 352 to 991 beds by 2021. The project proposals needed to address projected growth in Services and Activity of almost 200% by 2021/2022 with works budgeted at approx. $1.6 billion with completion expected in 2016. The existing Hospital is mostly 2-storey and the foundation is unsuitable for vertical extension so the proposed solution involves a complete replacement of the Hospital on the existing ‘on-grade’ carpark. 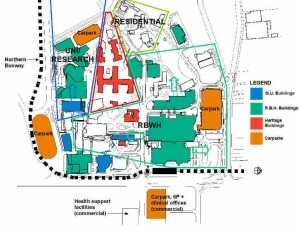 The Master Plan has to accommodate significant catch-up of workload that would need to occur as soon as the first stage of work was completed and also be in a position to maintain efficiency and safety whilst the second stage of work was under construction and the Hospital was spread across both old and new facilities. This meant that the first and second stages would need to be almost self sufficient and that only non-urgent services could continue to function in the ‘old’ part of the facility. The design was driven by the need to develop Master Planning solutions that would allow the upgraded Emergency Department needed in Stage 1 to be located in a position that would suit both the current workload and the projected role of the new facility. Garry Coff assisted Woodhead Architects in the preparation of a Master Plan for development of the Hospital with a focus on increasing Ambulatory Care Services to meet the changing needs of the catchment community. Goulburn Base Hospital is a 102 bed General Hospital in rural New South Wales serving the city of Goulburn and surrounding Districts with a catchment population of 35,000. The Hospital has had limited funding for facility upgrading over the last 10 years and it was recognised that many areas of the Hospital have become inefficient and potentially unsafe for continuing use and that significant redevelopment will be required over the next 10 years. Considerable upgrade is required to all Clinical Departments of the Hospital to shore up poor Departmental relationships that have developed over the past 10 years. Whilst employed by Woods Bagot, Garry assisted in the preparation of the Functional Design Brief and Master Planning Proposal for the redevelopment of the Hospital, which included the closure of lfould Street and the development of the entire site bounded by Wakefield, Flinders, Hutt and Daly Streets and incorporating the heritage listed School of Music facilities. The first stage of the project which comprises Day Surgery Suite, Medical lmaging Services and Consulting suites was subsequently designed and documented by Woods Bagot and constructed at a cost of $ 10 million. Garry Coff Consulting Services was commissioned in July, 1995 to prepare a Condition of Asset Statement and Facility Master Plan for the Murray Bridge Soldier’s Memorial Hospital. His involvement with the developing Hospital included a number of small extensions and refurbishments to improve efficiency and safety in the operation of the Facility. He was further commissioned as part of the Design team headed by Matthews Architects, to provide Health Facility Planning support to the project. The Hospital redevelopment was finally commenced in mid 2004 and was completed in early 2007 to a budget of approximately $ 11 million. The Hospital was reduced to 44 beds and the project included upgraded Accident & Emergency facilities, Medical Imaging facilities, Community & Allied Health accommodation and associated support areas. Amalgamation Project: As the core of the Woods Bagot Health Design team Garry was involved in the preparation of the Feasibility planning report for the now completed amalgamation of the Adelaide Children’s Hospital and The Queen Victoria Hospital. Garry Coff subsequently joined the South Australian Health Commission as Health Facilities Planner and represented the S A Health Commission at committee level during the Master Planning and design stages of the project. Level 5 Redevelopment – Garry Coff Consulting Services and Lapsys Keam Architects, in conjunction with Services consultants, Lincoln Scott Australia, were jointly commissioned in May 1998 to conduct a planning study to examine options for development of Level 5. The study objective was to meet the operational requirements of the existing departments on the ‘hot floor’, and to establish a 20-bed Day Procedure area and a new High Dependency Unit adjacent to the redeveloped Intensive Care Unit. This required redesign of Level 5 including Nurseries, Inpatient Units, Department of Anaesthesia and Consultant accommodation and alterations to the Operating Suite and was budgeted to cost $ 15.3 million. Garry’s role included the co-ordination of 16 User Groups to determine needs and to develop ‘signed off’ Functional Briefing documents and Concept layouts for each area to provide the base for a Master Concept Plan for the proposal. This included the establishment of staging options for the proposed works. The consultancy included broad brush Master Planning Concepts for each facility to enable short term upgrading of substandard/high risk areas of operation and to develop potential use for under-utilized areas of each facility within the context of a longer term strategic planning framework. Garry Coff Consulting Services was commissioned in 2007 to prepare Concept Designs and planning solutions for proposals to construct a Primary Health Care Facility that will integrate the local medical practice, community and allied health services, dentists, aged care day centre and accommodate a range of private health practitioners. Development of the proposals included negotiation to establish a number of partnership initiatives to improve distribution of services and support within the community in the context of advancing the Regional Health Centre initiatives of the Commonwealth Government and the GP Plus model of Primary Care being implemented by the SA Government. Garry Coff has recently produced a Service Delivery Plan for the Health Service and has assisted Greenway International as Health Planner for upgrading of the Day Surgery, Delivery and inpatient areas of the facility. We were also engaged to develop site concept planning proposals for future development of the site to meet predicted growth in the areas of ambulant care and Community Health support services and to address cxarparking shortages experienced as a result of unexpected growth in services since 2005. Whilst employed by Woods Bagot as Principal Health Planner, Garry Coff carried out the preparation of briefing and Master Planning for the upgrading of facilities to meet the requirements of the hospital in its new role as a Multi-Purpose Service Health Centre. A major element of the planning process was the introduction of culturally appropriate facilities to meet the needs of both the European and Aboriginal sections of the Hospital Catchment Community. The design included a number of elements that would allow flexible accommodation, able to meet the needs of both tribal and urban Aboriginal clients, and the introduction of safe areas outside the building for recovering patients and their families. Following the establishment of his own practice in November, 1994 Garry continued on with this project to carry out design development and contract documentation. The developed design solution involved the refurbishment of previously under-utilized staff accommodation buildings as Nursing Home accommodation and reconfiguration of the existing Hospital Inpatient unit to improve efficiency and reduce operating costs. The facility was occupied in June 1997 with final costs of approximately $1.65 million. Review of the new Ramathibodi 300 bed stand alone Hospital addition, adjacent to the existing 2000 bed University Hospital, driven by the intention to attract and service Asian clients currently travelling to the USA for surgical procedures. Review of the new Siriraj Piyamaharajkarun Hospital 300 bed expansion of the existing University Hospital with a focus on attracting VIP clients and providing high quality care in conjunction with the adjacent 1500+ bed Mahidol University Public Hospital. Review of the Queen Sirikit National Institute for Children’s Health (QSNICH) including Development proposals for occupancy of a new building and the preparation of a High Level Master Plan for predicted growth of Services to meet increasing activity for the next 10 years to 2021. Peoples Hospital of Pizhou, China. Garry Coff Consulting Services was contracted to VAMED Healthcare Ltd in Beijing, China to provide Health Facility Planning advice and support and has recently completed the preparation of Schedules of Accommodation and Concept Planning for a 1500 bed Public Hospital in the rural centre of Pizhou, South of Beijing. The new Hospital will be constructed on the site of an existing Medical Centre that includes Radiotherapy Services and some existing consulting services. The design included a First Stage of Construction comprising 600 beds with 16 Operating Theatres and support infrastructure. MCS Private Hospital, Ulan Bataar, Outer Mongolia. Garry Coff assisted VAMED Healthcare Services (China) Ltd in the preparation of Schedules of Accommodation and the Concept Design for a new 110 bed Private Hospital for the MCS Corporation in Ulan Bataar. The new Hospital will include accommodation for visiting specialists and full Surgical Capability to support a range of high level specialties including Cardio-Thoracic Surgery. Construction was expected to commence mid 2008 with completion planned for late 2009 but the project has been delayed awaiting the finalisation of funding and contract arrangements.